Thanks Wysgal for the mention! And the other five blogs mentioned are all interesting reads, including Franco et al at Table for Three, Please, Southbound.ph, Burnt Lumpia by Marvin, 80Breakfasts by Joey and No Special Effects by Manggy. 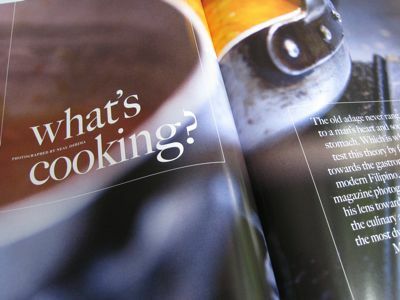 Also in this issue of Rogue is an article and great photos by Neal Oshima of several of Manila’s top chefs today, and an article (albeit oddly written) that follows the journey tuna takes from the seas off of General Santos City to a market or restaurant in Seattle, as well as other food related articles. Nicely done overall. And totally worth the PHP180 price. Along with Town & Country, these have to be the two highest quality locally produced magazines on the market. 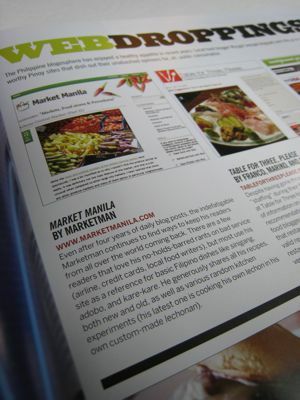 And with this I am assured we’ll be meeting new readers/fans of Marketmanila. That’s for sure! Thanks, Wysgal. Anyway, as Krizteene pointed out you’ll be having more visitors to your blog in the future. Topster, had dinner with a friend last night who looked at the cover of the magazine and said, “hmmm, it must be the make-up or something…” heehee, whatever that meant. Actually, I haven’t experienced a rise in readership lately (big jumps typically occur when featured on stumble upon, a newspaper, etc. ), but maybe more folks will buy Rogue? :) I jest. There was a time in India not too long ago when there was a strictly enforced interdict against ecdysiasts and to skirt this issue, they have instead wetness bars where the entertainers wear diaphanous clothing that were periodically doused with water. Honey would be a sweet and and even more titillating addition. my,my,my,MM…fame and renown!! pls don’t leave us for the glossies. You’re becoming quite a celebrity/philanthropist. Kudos by the way on the feeding program! hi MM! i like reading Rogue because most of its writers are pretty good, though with a dollop of chi-chi-ness. i loved their issue which was a tribute to the music industry and i would probably like the new issue as well since it’s about food and you’re included there! I don’t only learn about food and cooking, I am also forced to look up the meaning of the word “ecydysiasts”. Thanks guys. I LOVED the Neal Oshima photos! Congratulations on the mention too! Mr. MM, maybe next time nasa FHM ka na rin, hehe.. more power! Itâ€™s a telling lesson on prudery isnâ€™t it. The culture that produced the Kama Sutra disallowing common stripteasers. The book that gives you a headache if you try to figure out what goes where and a backache if you even partially put it into practice. But as an Indian friend says, we only wrote that book to sell scented oil to white people you know. I will buy my first issue of Rogue because of you! I guess it comes with being a grade school religion teacher, but the cover of the “appetite” issue makes me lose mine. let me go consult my ecdysiast about this issue. very old stripper = ecydysiaster! I wonder if the honey is wild….. This reminds me of the Sharapova post that mostly elicited comments from guys. Btw, Artisan Chocolatier, any honey applied that way is ipso facto wild. With her pronounced “S” posture, she is not unlike a snake writhing in a state of ecdysis. Although honey will not provide relief, it stings on the skin, I heard. what a cover! Had to do a triple take there. Congratulations on the feature. I agree with Katrina, Its a good magazine and its worthy of having Marketmanila ! She is great in her pose, I collect all the magazine where amanda griffin is the featured model..Another collection to be added from rogue.. My Honey Dream..
Caimito or Star Apple – At the Markets Now!! !